Cambodia is not only famous for the Buddist temple and Angkok Wats, but also well-known for its appetizing and original cuisine. Let travel with us and point out 10 food must eat in a beautiful in Northwestern of Cambodia-Siem Reap. Prahok is known as a distinctive feature of Cambodia cuisine. To make prahok, the locals have to prepare well processed fish, salt, sugar, pepper, garlic and cold rice. First of all they will process the fish and expose fish to the sun for a day then mix with all of the spice and keep this mixture in a jar for several months. 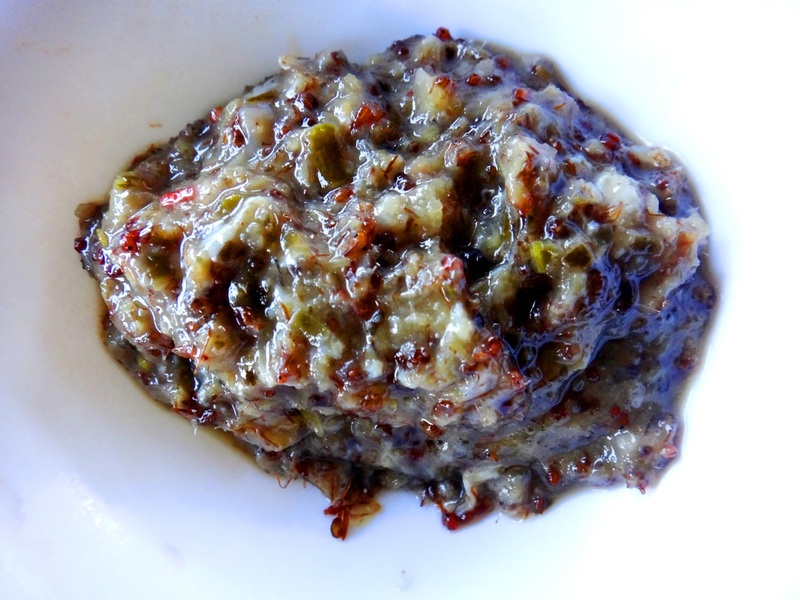 Prahok is able to eat when it become pasty and the color turn gray with a specific smell. This food is a traditional food of Cambodian as well as a spice to put into broth of some noodles soup. You can find Amok fish easily in Siem Riep because this it is the outstanding dish of Khmer’s cuisine. Foreign tourists say that Amok has a eye-catching look because it is served in a fresh coconut or sometime it is wrapped in banana leaf with the coconut cream on top. Amok is actually a thick yellow curry and the locals usually use catfish or white fish as the main ingredient of amok. Besides, the spices that come along with fish in this dish is also the key of amok’s unique flavor. Though every family here has their own recipe for this special food, the indispensable spices are garlic, satl, prahok, brown sugar, lemongrass, galangal, chili paste and coconut milk. You can also enjoy amok with rice. Cambodia has many good mango varieties; therefore, the green mango salad here is also a beloved dish of not only the locals but also the foreign tourists. Green mango salad is made from tart green mango and seasoned with fish sauce, lemon juice, sugar, minced garlic, red hot pepper, some types of fresh herbs. The subtle point of this dish is the moderated sourness of green mango and amazing taste of the dressing. This salad is so popular in the region so you can order this dish as you appetizer in every restaurant or at any roadside food stall in Siem Reap. Walk down the streets in Siem Reap you will can’t help being at fault when there are too many fried insects sold at the roadside food stalls. It’s said that this is a popular food of the poor Cambodians in the past. Because insects are not only very cheap but also have a high nutrition content. Nowadays fried insects become so popular that you can find this special food at some luxury restaurants in the city. There is a market that specializes in selling fried insects in Siem Reap where you can see many kinds of insect like spiders, wasps, crickets or silkworms. The locals season the insects with salt, sugar, herbs and chili then fry them into deep oil pan. Fired insects taste really good and so crispy. Rice is a main food in every meal of every family in the Southeast Asian nations and normally people don’t pay much attention to this flat and vapid food. However, bamboo sticky rice in Cambodia will make you change your mind at first try. Bamboo sticky rice is absolutely cooked in bamboo sections so first of all the locals have to collect the bamboo then process cleanly and chop bamboo into sections that about 30 centimeters in length. In the next step, Cambodian mix sticky rice-a special rice grown in Cambodia with black eye peas and a little bit of salt then they stuff up those bamboo sections with this mixture. Finally they add the coconut water in these bamboo sections and grill it directly on the coal for an hour. The secret of good bamboo sticky rice is you have to revolve the bamboo sections while grilling. You will never forget the fresh taste of coconut together with the savory taste of sticky rice, peas and salt in this dish. Khmer noodles is the popular English name for Nom Banh Chok being called by locals and tourists and one of the best noodles in Cambodia which is becoming a noodle symbol for this country. Basically Nom Banh Chok is served the most for breakfast. But when you come to Siem Reap, it is available in most restaurants and for all meals because it is beloved by most locals and visitors. You can easily find Khmer noodles from street vendors, restaurants, buffets or even in cafe shops. Primarily, Nom Banh Chok's main ingredient are rice noodles, curry sauce, veggies like fresh mint leaves, spring onions, banana flower, bean sprouts, cucumber and some pork slices on top. What makes the noodles good and different from one to another is how the curry is made. But the common taste of all Nom Banh Chok is from lemongrass, turmeric root and kaffir lime which is cooked in the curry. Nom banh chok is one kind of noodles which is often sold by the vendor in the morning. Cambodian is so in love with grilled food that you can find this kind of food everywhere in Cambodia and most restaurants here have charcoal-burners. The grilled food here is very plentiful of ingredients and you can see the locals grill seafood like fish, shrimp, squid or meat like pork, chicken, duck, beef or even insects. Cambodian BBQ has a strong and charming flavor due to the original and subtle use of spice. The Khmer cakes are sweet yet savory, made with taro, mung beans and a few preserved bits of fruit on top to give it sweetness. Khmer cake is another good option for someone who is sweet-tooth. But the special thing of this cake is the perfect combination of sweetness and savor which makes Khmer cakes beloved by everyone. When eating Khmer cakes you will find taro mung beans inside and some small pieces of dried fruits on top. Right at the first bite you can feel it is a bit crunchy outside and soft inside the cake which gives you the interesting joy of eating this cake non-stop. You can find various dishes made from insects in Cambodia. One of them is stir-fried ants with beef, which appeals most tourists to put their order on the menu. The name of the dish speaks all enough the main ingredients. Food made from ants is not so strange to visitors who used to travel to Southeast Asia. But ants in association with beef can only be found in Cambodia. Ants of all sizes are stir-fried with a bunch of spices -lemongrass, ginger, garlic, shallots and thinly sliced beef. This is a aromatic dish with sour flavor which the ants impart to the beef during marination. After all spicy and hot food you have tried in Siem Reap, Jaggery sweet soup is an ideal balance to satisfy your taste. It is a concentrated product of date, cane juice, or palm sap (see palm sugar). It's colors vary from golden brown to dark brown, which will make the typical color in a bowl of jaggery sweet soup. Jaggery is a rich source of iron. It also contains many minerals salts not found in ordinary sugar. Therefore a jaggery sweet soup will reboost your energy for the journey in Siem Reap. Jaggery sweet soup is a sweet thick soup with potato cubes and green beans and best served in cool or with some ice. Siem Reap, Cambodia is a great tropical food destination that attracts a lot of attention from visitors, especially western visitors. There is no enough time for any tourist to taste all dishes in Siem Riep, So we introduce some good popular dishes that every visitor should try when you are here and there are still more you may find somewhere in this city.